You can add Production and non-Production (Sandbox) instances to a Dynamics 365 for Customer Engagement apps subscription. Each new instance creates a separate organization that can be used by different departments, locations, or for non-production purposes such as development. For more information on the instance types available to you, see Microsoft Dynamics 365 for Customer Engagement apps pricing and licensing. Purchase the Customer Engagement instance on the Microsoft online services portal Purchase subscriptions page. Additional storage and instances can be purchased by customers who have a paid Dynamics 365 for Customer Engagement apps Professional user license subscription. You must have the Office 365 Global administrator (however, see Note below) to do these tasks. For more information, see Assigning administrator roles. What information do I need to create an instance? When you add an instance, you can accept the default values, or enter different values to create a Customer Engagement instance. Select which scenario fits you best. The apps you can choose depend on the licenses you've purchased. If you haven't purchased any Customer Engagement licenses, you'll only see None of these (don't preinstall any apps). Name. This is typically the name of your organization and is displayed in the Dynamics 365 for Customer Engagement apps. URL. The URL is used to construct the URL for users to sign-in to the Dynamics 365 for Customer Engagement apps. Therefore, we recommend that you limit the length of URL name to reduce the overall length of the URL. Purpose. This value is used to associate the instance with a specific intent and is only displayed in the instance picker, which is accessed through the Dynamics 365 admin center. For example, if this instance is for exclusive use by your sales and marketing departments you can enter Contoso Sales and Marketing or if the instance is for development and for testing purposes enter a relevant name such as Contoso Development. Security Group. This value is used to determine the Microsoft Online Services security group that includes the users who will have access to this instance of Customer Engagement apps. For more information, see Control user access to instances: security groups and licenses. If you do not specify a security group, all users associated with the subscription who have a Customer Engagement apps license will be added to the new instance. Country/Region. You can specify a region for the instance. To request the ability to create Dynamics 365 for Customer Engagement instances (Production and non-Production) in more than one geographical region, please contact your account manager or Technical Support. Currency. When you add an instance, you must select a base currency before the instance is provisioned. Although you can add currencies in the Dynamics 365 for Customer Engagement apps, only the base currency will be used for reporting. Once set, the base currency cannot be changed. The following steps apply to customers who do not purchase using volume licensing. Volume license customers should see: Microsoft Volume Licensing Service Center. Sign in to the Microsoft 365 admin center as an Office 365 Global administrator. In the navigation pane, click Billing > Purchase Services. Proceed through the screens to purchase additional instances. For more information, see Microsoft Dynamics 365 for Customer Engagement apps pricing and licensing. Close your Customer Engagement apps browser session and open a new session to force an update to the Manage your Dynamics 365 instances page. Select the instance that you want to configure, and then click Configure. If the instance does not appear in the list or is in a state other than ready to configure, wait a few minutes and then try again. 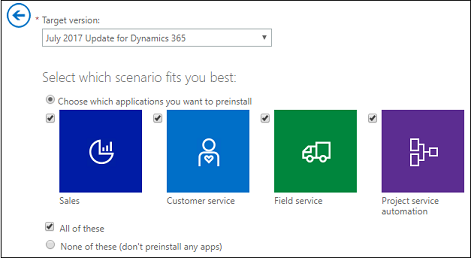 Or, close your Customer Engagement apps browser session and open a new session to force an update to the Manage your Dynamics 365 instances page. You cannot start a new Customer Engagement instance until you click Configure and complete the configuration process. Customer Engagement instances will not come prepared with sample data when configured by an Office 365 Global administrator who does not have a Customer Engagement apps license. Sample data may be added later, after the instance is configured and ready to use, by a Customer Engagement apps licensed user who has the Dynamics 365 for Customer Engagement apps System administrator security role. For more information, see Add or remove sample data. On the configure new instance page, enter your settings, and then click Next. On the Confirm some details page, verify that the country/region and currency displayed are correct. Although you can add currencies in the Dynamics 365 for Customer Engagement apps, only the base currency will be used for reporting. After a base currency is selected it cannot be changed. After you have verified that the base currency is correct, click Finish. Once your instance is set up, make note of the URL and click or tap it to launch Customer Engagement apps. Prepare the instance for users by assigning security roles, creating teams, customizing, and importing data. More information: Getting Started. What is the effect of an additional instance on storage? When you add a new Customer Engagement instance, the new instance and any existing instances will consume the existing storage that is available to the account. Warnings will be communicated when storage is near capacity. If your company has multiple Customer Engagement instances, you can use security groups to control which licensed users can be a member of a particular instance. Coho Winery Sales Sales_SG Provide access to the organization that creates sales opportunities, handles quotes, and closes deals. Coho Winery Marketing Marketing_SG Provide access to the organization that drives marketing efforts through marketing campaigns and advertising. Coho Winery Service Marketing_SG Provide access to the organization that processes customer cases. Coho Winery Dev Developer_SG Provide access to the Sandbox instance used for development and testing. In this example, four security groups provide controlled access to a specific organization. When users are added to the security group, they are added to the Customer Engagement instance. When users are removed from the group, they are disabled in the Customer Engagement instance. When a security group is associated with an existing instance with users, all users in the instance that are not members of the group will be disabled. If a Customer Engagement instance does not have an associated security group, all users with a Customer Engagement apps license will be created as users and enabled in the instance. If a security group is associated with an instance, only users with Customer Engagement apps licenses that are members of the instance security group will be created as users in the Customer Engagement instance. When you remove a security group that is associated with a Customer Engagement instance, either by editing the instance and removing the security group or by deleting the security group, Customer Engagement apps licensed users who were members of the security group will have the same access to Customer Engagement apps. When you assign a security group to an instance, that instance will not show up in the Instances tab (instance picker) in the Dynamics 365 admin center for users not in the group. If you do not assign a security group to an instance, the instance will show up in the Instances tab (instance picker) in the Dynamics 365 admin center even for those who have not been assigned a security role in that Customer Engagement instance. You cannot make security groups members of other security groups. All licensed users, whether or not they are members of the security groups, must be assigned Dynamics 365 for Customer Engagement apps security roles to access Customer Engagement apps. You assign the Dynamics 365 for Customer Engagement apps security roles in the Customer Engagement apps web application. Users can’t access instances of Customer Engagement apps until they are assigned at least one security role for that instance. More information: Grant users access to Microsoft Dynamics 365 for Customer Engagement apps (online). Change the type to Security group, add the group Name and Description. Click Add > Close. Click the group you created, and then next to Members, click Edit. Click + Add members. Select the users to add to the security group, and then click Save > Close several times to return to the Groups list. To remove a user from the security group, select the security group, next to Members, click Edit. Click - Remove members, and then click X for each member you want to remove. If the users you want to add to the security group are not created, create the users and assign to them the Customer Engagement apps licenses. To add multiple users, see: bulk add users to Office365 groups. In the Microsoft 365 admin center, click Users > Active users > + Add a user. Enter the user information, select licenses, and then click Add. In the Microsoft 365 admin center, click Admin centers > Dynamics 365. Click the Instances tab, select an instance, and then click Edit. In security settings, search for a specific security group, and then click Next > Save. Sign out of Dynamics 365 for Customer Engagement apps and the Office 365 admin portal. Close all open browsers used for Dynamics 365 for Customer Engagement apps and the Office 365 admin portal. Sign back in to Dynamics 365 for Customer Engagement apps and the Office 365 admin portal.